While numerous programming solutions exist, they fail to provide a clean high-level declarative programming solution for NXT. Programming robots, especially mobile ones, is a complex task, involving some typical AI problems, such as knowledge representation and processing, planning, etc. These areas are much more accessible with the use of a declarative programming solutions, compared to classic, low-level imperative languages. The paper presents research developed within the HeKatE project http://hekate.ia.agh.du.pl aimed at providing a high-level rule-based programming solution for Mindstorms NXT, based on the Prolog language API for the NXT platform. ultimately integrate with the higher XTT layer. The whole platform based on this new Prolog API is planned as presented in the figure below. In the figure the highest visual rule-based logic design with XTT is also included. The focus of this paper is the design and prototype of the Prolog API layer, indicated in the figure by the dotted line. 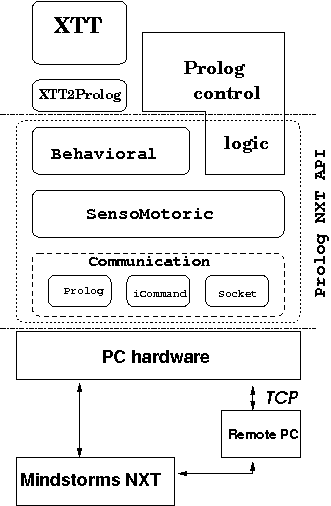 In order to reuse and support some of the existing solutions, as well as provide implementation flexibility, it's been decided to provide in the first stage a Prolog library, with the following features: it is executed on a PC, controlling an NXT-based robot, the control is performed with the use of the Bluetooth or USB cable connection, the low-level communication is provided by some well-tested existing communications modules, at the functional level the API is coherent with other available solutions. Considering the requirements the following API architecture has been designed. It is composed of three main layers as observed in the figure above. behavioral layer providing a higher-level functions, e.g. drive. The sensomotoric layer controls the components of the Mindstorms NXT set motors, all the sensors, as well as Brick functions. This layer can be used to directly read the sensors, as well as program the motors. This is a layer, that can be used by a programmer to enhance high-level behavioral functions. a hybrid socket-based solution, using the NXT++ library, that communicates with the robot. All of these actually wrap the Mindstorms NXT Communication Protocol. The first solution is the most straight forward one. In this case standard ISO Prolog stream predicates can be used to control the serial port. Prolog terms that wrap the NXT protocol have to be provided. In the second case the Prolog communication module is integrated with iCommand with the use of the SWI Java to Prolog interface called JPL. Prolog calls are mapped to the iCommand methods. In the third case, a simple server written in C++ exposes NXT communication with a TCP socket. The Prolog communication module connects to the server and controls the robot through a TCP connection. This opens up a possibility of a remote control, where the controlling logic is run on another machine, or even machines. Besides some basic send/receive functions the library has to provide certain services. These are event and time-based callback. For example, it should be possible to instruct the robot to e.g. “drive till you hit/approach an obstacle, then make a sound, wait for a response for some time, if you don't get one, turn and drive on”. So the library has to provide timers that trigger some callbacks, as well as event-driven callbacks. This requires parallel execution of certain threads. communication layer see iCommand, TCP, and serial versions. sensomotoric layer see the main page. behavioral layer see the main page. The main API page is here. A complete downloadable version of the API will be available soon. The API will be licensed on the GNU GPL v3. See the main page of the API for a development version. A first paper describing the design and the implementation of the API is here.